Having made the decision to stay in Hartlepool to await our nephew Iain and wife Sarah’s arrival, we decided to explore a bit further. This time we headed north to the magnificent Roman ruin, Hadrian’s Wall. Begun in 122 c.e. and built over a six-year or so time period, this stone wall ran 73 miles from the Solway Coast in the west to Wallsend near Newcastle upon Tyne in the east and incorporated 17 forts and 80 milecastles (these were much smaller buildings placed roughly one mile apart housing anywhere from 12 to 30 soldiers). Emperor Hadrian (76-138 c.e.) built this wall as a defense against the wild and wooly ‘barbarians’ whom he and his predecessors didn’t have any luck taming. So, instead of expanding the Roman Empire, he consolidated it. He was quite a guy. When Hadrian’s father died, his father’s cousin Trajan became his guardian. Lucky for Hadrian, Trajan later became emperor (98-117 c.e. ), and when he died, Hadrian followed in his footsteps. Although, some say he set himself up better for getting the emperor title by saying he had been adopted by Trajan and his wife. Whatever. It worked, and Hadrian left his governor’s post in Syria to rule the Roman world. This emperor is considered one of the good ones due to his belief in the philosophy of stoicism. In trying to find a concise definition of this ancient Greek philosophy, I stumbled across one on the Internet that says stoicism is learning to enjoy what you have and not crave what you don’t. I guess taken further this philosophy evolved into enduring pain without showing it. I like the first definition better. Hadrian, I gather, was a realistic guy who was strongly influenced by the Greeks, hence the stoicism. He was the first emperor to grow a beard, which was a Greek thing to do. He loved building (no surprise there) with one of the most memorable landmarks in Rome, the Pantheon, in existence today thanks to him as well as his villa at Tivoli. He travelled through his empire extensively (all the places in orange are places he visited) and he came to Britain to inspect his wall in 122. Not being a dummy he married his guardian’s great-niece, Vibia Sabina, in 100, yet loved a young male Greek named Antinous. His lover tragically drowned, and they say Hadrian never fully recovered from this loss. This stone barrier snaking across the top of England offers a wonderful glimpse into the lives of those Romans who built and defended this stretch of the Roman Empire. Knowing we only had one day to do view this structure, we selected three sites to learn about Hadrian’s Wall. The first was Houseteads Roman Fort, touted as the most complete Roman fort in Britain. It’s also where you can actually see the wall and even walk on part of it. The fort was a half-mile from the visitor’s center, so we trekked up spotting sheep spotting us as we climbed to the little museum and the fort itself running along part of the wall. I must say you have to use your imagination to envision the way it must have been back in Roman times, but the displays both in the little museum and explanations on site were excellent educators. Having explored the fort we went to the wall and slowly travelled a bit with Max perfecting his Roman soldier stance and his one-foot-down-one-leg-up pose. He also checked the stones to ensure they were properly set. It was a beautiful day so the stroll both on and beside the wall was spectacular, including a visit from a welcoming puppy eager to share her sheep poo. Peering down one side of the wall we found ourselves once again in awe of the engineering prowess in building something so substantial without the benefit of the mechanical tools and construction aids we have today. They would build an envelope of well-placed stones and then fill the middle with rubbled stones and used lime stone to cement it. 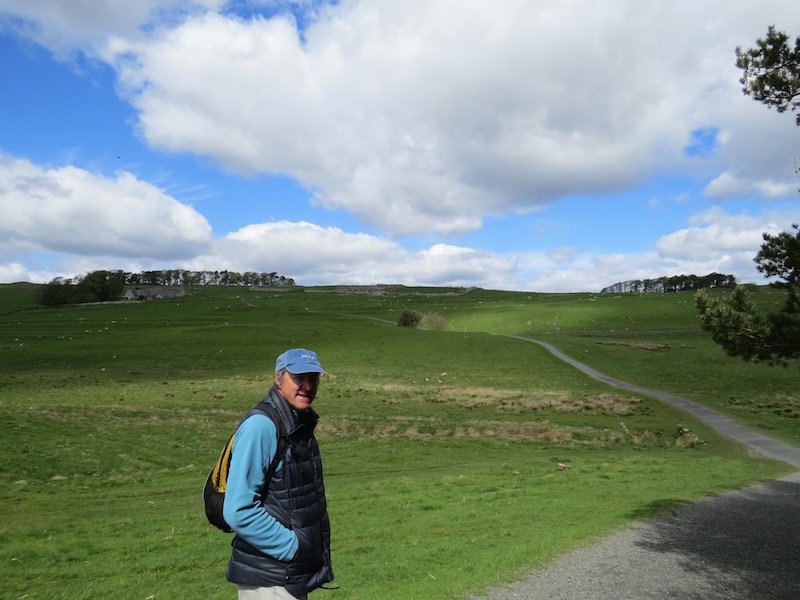 Our next stop six miles away was a twofer: The Roman Army Museum and Vindolanda. To reach the museum you enter through the remains of a settlement outside the fort, then through the fort itself. What’s really cool about this site is that you can watch archaeologists find items as they continue to excavate this fort. We stopped to chat and were there when they pulled out a nail that hadn’t seen the light of day for over 1800 years. We were the first people to hold it since some Roman had used it for construction. The archaeologist who showed it to us said the reason for finding such excellently preserved artifacts was due to the aerobic soil. Since the fort was built atop eight previous ones, tons of items were stuck in the mud keeping them safe and sound until dug up and help by folk such as us. to the most important of all, writing tablets. To me it’s fascinating to imagine this woman sitting down to ask a friend to join her for a birthday celebration. In spite of the language being both flowery and formal, the warmth of this friendship is apparent. Can’t you see her? I could. First discovered in 1973, many of these tablets are now housed in the British Museum and listed as one of their top ten treasures. Fortunately, for us, Vindolanda were able to keep some for display. Another unique find in addition to the writing tablets was the actual fringe you see illustrated on Roman helmets. They came this is the only one to-date found fairly intact. Having sated our desire to experience Hadrian’s Wall, we headed for the car and started looking for an inexpensive place to stay while driving these windswept moors. After checking out several pub accommodations in small towns along the way, we found one that came with bathroom en-suite, a full English breakfast and a friendly pub-keeper. Pretty wonderful way to spend a night and morning break. Next day we headed due south, back to The North Moors National Park where we first travelled through to get to Whitby and Robin Hood’s Bay. Only this time we’d be on the far SW corner at Ducombe Park. The reason for heading to this park in Helmsley is that it featured the International Centre for Birds of Prey. I had read about this organization in one of the many pamphlets we’d picked up and I was curious to see the flying demonstrations they touted. I’d never forgotten one I’d seen in Scotland over 14 years ago. It was a friend’s (Marci’s) birthday, and Joanna, her partner, had arranged an amazing party. My sister Betsy and I went. It was spectacular. And, one of the optional events was seeing the bird man with his birds. So, when I saw I could show Max something similar, I persuaded him to go. In spite of two roadmaps, an iPad GPS, and our own eyes, and with 2.5 hours to make a 1.5 hour journey, we barely made it to the first showing at 11:30. Thankfully our navigational skills at sea seem to be better than our shore based ones. 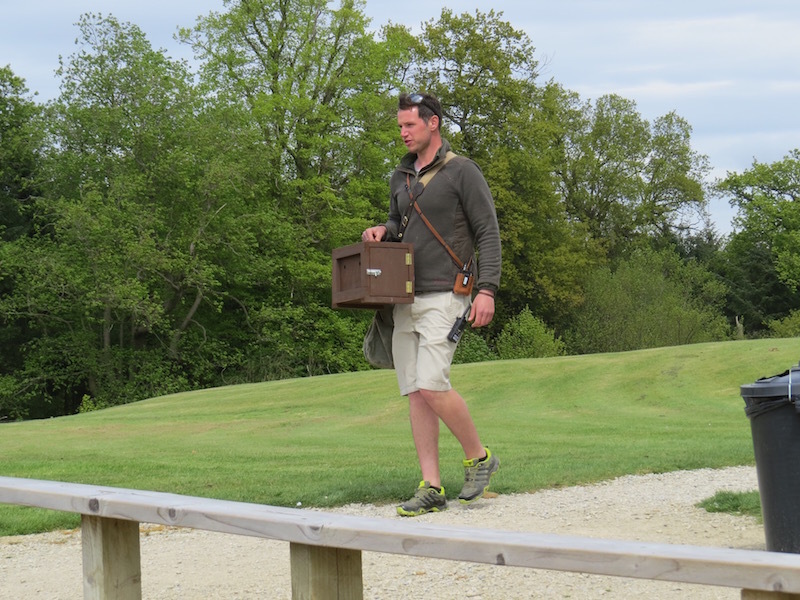 Two trainers alternated flying several different types of birds. The demonstrations were filled with lots of swooping birds but also time spent gazing at the sky or a tree in search of the free-flying object. The trainers were excellent, though, at keeping up an educational patter as we all strained to see a little birdie. Lots of practice, no doubt. resulting in both emcee and actor being content. After the first show we toured the facility where these birds of prey are captivity bred for conservation. This northern branch was opened in 2013, and the site is both lovely and engaging. We walked among all the pens (each bird is flown every day) and I snapped photo after photo. Unfortunately, it was through mesh screens for most of them; but, don’t worry–I’ll only post a few! The profiles were so regal it was as if these birds were used to posing for photographs. And, the owls were wonderful. I mean, look at these faces. The first one below has a wreath of feathers that are amazing in their exactness. The face appears to have been shaved with the underneath part being the tiny white feathers. 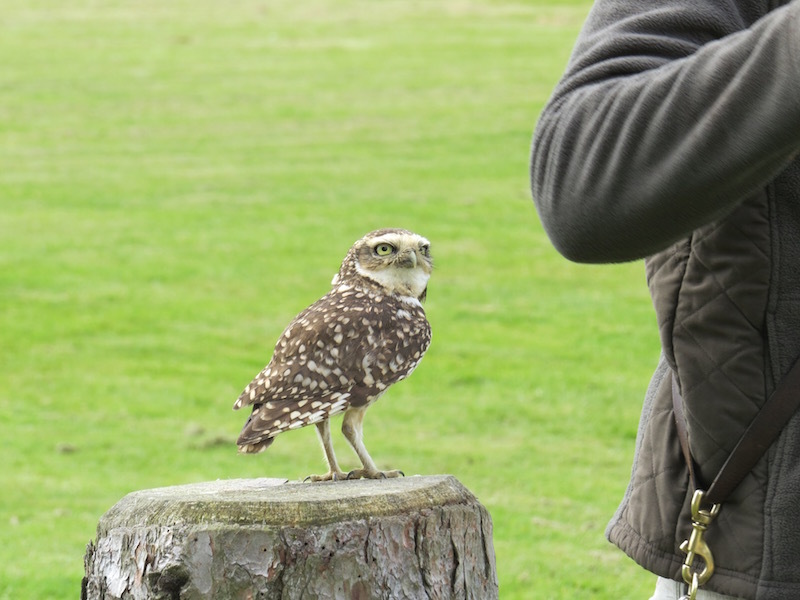 The wee burrowing owl (so small it can’t carry the weight of a radio transmitter like the larger birds have, so it gets its own carrying box) was a comedian as the trainer explained how they couldn’t fly that fast so to escape predators they burrowed. He told us they can sometimes share prairie dogs’ homes, and the dogs actually appreciate these little fellows because their whistle will alert everyone to danger; and, if a snake tries to come down, the owl can imitate another snake’s hiss scaring off the approaching menace. Of course, there was the comical moment or two. then took in one more demo where we saw the largest bird being flown, the Sea Eagle. The trainer said he grew up around here and, when he was little, he pleaded with his parents to take him to see the birds. They did so and he saw a sea eagle. From then on he fell in love with the majesty of birds. Twenty years later, he’s back and training and flying the son (!) of those same birds he first saw so long ago. Karma. What is so exceptionally clear is the devotion these people have for these birds. That emotion came through with every bird they flew. Happy to have experienced this intriguing center it was time to return to JUANONA, and so we set off, driving through the beautiful English countryside to Hartlepool. This entry was posted in 2015 05 UK - East Coast, 2015 Summer Cruising, COUNTRY, England, Europe, SUMMER CRUISING on June 8, 2015 by margaretlynnie.